Health reform spends more in states with more uninsured residents. 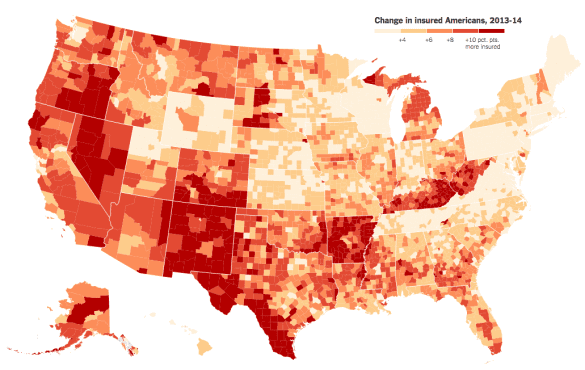 And red states have higher rates of uninsurance than blue ones. In 2013, of the 25 states with the highest rates of nonelderly uninsured, 18 of them had voted for Mitt Romney in the 2012 election. So all else equal, a bill that spends its money covering the uninsured is going to spend more money in red states than blue ones. But all else isn’t equal. 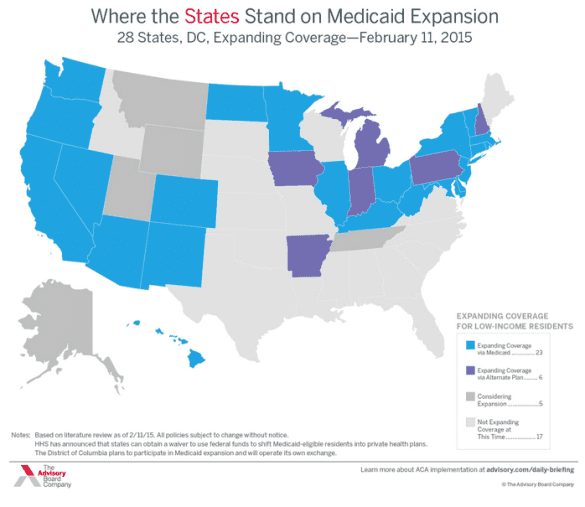 The way Obamacare pays for itself also favors red states. One of Obamacare’s major pay-fors is a 3.8 percent tax on investment income earned by richer taxpayers. This hits blue states harder than red states because blue states are, well, richer. Of the 25 states with the highest median income, 19 voted for Obama in 2012. Another way Obamacare funds itself is through its tax on “Cadillac” health-care plans, which begins in 2018. The tax is really just a levy on very generous employer-provided plans — which are more common in blue states, with their history of unionization, than red ones. That means the Cadillac tax will hit harder in blue states than red ones. But here’s what’s even weirder: Republicans have been working really hard to reverse that setup so that they pay more to get less. When the Supreme Court made the law’s Medicaid expansion optional in 2012, it was GOP-controlled states that opted out. This didn’t save them any money– the federal government would have paid the entire cost of expansion until 2016, and those other taxes didn’t go away–all it did was leave millions uninsured in their own states. And if the Supreme Court rules in this latest case that the only states who build their own health exchanges can get subsidies, it will again be residents of red states getting screwed. A pair of maps from The New York Times, using survey data from the nonprofit group Enroll America, clearly illustrates how Republican states are shooting themselves in the foot. The ACA had the most impact in poorer states that did expand Medicaid– like West Virginia, Kentucky, Arkansas, and New Mexico, for example. 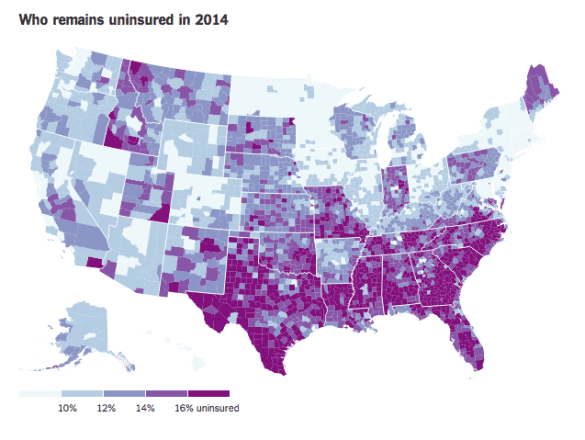 But some of the biggest coverage gains were also in states like Texas, Idaho, Oklahoma, and parts of the south– Republicans in these states fought Obamacare tooth and nail, yet they had counties where the number of people without insurance was cut nearly in half thanks to the new law. If the Supreme Court rules that subsidies can only be provided in states that run their own exchanges, it’s the coverage gains in these red states that will be reversed. Without subsidies, Obamacare enrollees will see their premiums jump by 256% on average. For states that want to participate in Obamacare, this is fixable– they can create their own exchanges (while still using healthcare.gov to handle all the technical stuff) and keep the subsidies. But many red states have no intention of creating their own exchanges, at least in the short term– heck, Alabama, Georgia, Indiana, Nebraska, Oklahoma, South Carolina even filed an amicus brief saying that they decided not to create their own exchanges specifically because subsidies would not be available on the federal exchange (this is likely a lie, but the claim shows they have no intention of taking steps to keep the subsidies). Yet, just as with their decision to opt out of the Medicaid expansion, they’ll still be paying the ACA’s taxes. The GOP is taking its own voters -— along with million of poorer people who live in Republican states — hostage. […] Democrats might want to deal on Obamacare because they want, as a moral matter, to cover poorer people in red states. But on a practical level, the post-King status quo is a much bigger disaster for Republican states than Democratic ones. Great piece. It really is incredible the way Republicans will “cut off their noses to spite their face”. But there is an explanation you didn’t consider. Well off Republicans in the red states really want to keep the poor downtrodden because, well, those aren’t the right kind of people. Unfortunately, this really does account for their actions logically, if cynically. On the other hand, most people will just interpret this as another way for them to hammer the ACA. Thanks, John! You’re right, that was an issue with the Medicaid expansion– red states get more and pay less than blue states overall, but it’s really Democratic constituencies that benefit the most. This latest case is different though, in that it would be a disaster for everyone who gets coverage through the individual market in red states. The subsidies provide a direct benefit to poor and middle class families on the exchanges, but they also help keep premiums down by bringing more young, healthy people into the marketplace– without them, premiums would increase (probably by a lot), even for those whose income is too high to qualify for subsidies. 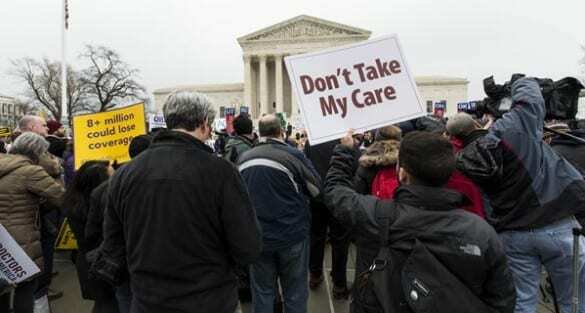 Next post: The latest Supreme Court Obamacare case hinges on Roberts and Kennedy– here’s what they’ll be thinking about.